Every so often a long neglected writer will be rediscovered, even in the world of translated literature – consider Sandor Marai’s Embers or Hans Fallada’s Alone in Berlin. One publisher in particular seems to be able to do this regular basis: step forward Pushkin Press. You might immediately think of Stefan Zweig and Antal Szerb, but within the last twelve months there has been I Was Jack Mortimer by Alexander Lernet-Holena and The Spectre of Alexander Wolf by Gaito Gazdanov. Now we are treated to Subtly Worded, a selection of stories from Russian émigré writer Teffi (a pseudonym explained in translator Anne Marie Jackson’s excellent introduction). The collection is also expertly curated, organised into five sections chronologically beginning before the Russian Revolution and continuing up to her final stories in the 1950s. In him we have a portrait of many manipulative, charismatic cult leaders since. The collection also contains a story about meeting Tolstoy, but, as the narrator is a child, the story is much less detailed. Names, she says, are generally prefaced by the phrase “that-crook.” The title story, another example of satire, humorous on the outside but with a darker truth at its centre, concerns writing letters to the Soviet Union. Everything must be phrased in opposition to the truth to prevent those receiving the letter being arrested – an early example of double-speak if not double-think. In the final stories, for example ‘The Blind One’, the humour is all but gone and there is a much more elegiac tone. In it the weeping of a woman is mistaken for the sound of an angel by two blinds girls. This, and the two which follow, are probably the most subtle, and saddest, stories in the collection. 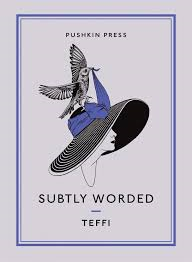 These stories are probably not among the greatest ever written, and Teffi is certainly not a literary giant, but they are a delight to read, and throughout you are glad that Pushkin Press have made them available again. You are currently browsing the archives for the Teffi category.